“No! You do it,” yelled not-yet three-year-old Jacob when his mother told him to clean up the milk she was sure he had deliberately spilled on the floor. Louise could feel her temperature rising. “You spilled it, you clean it up,” she said with as much patience as she could muster. Louise felt a familiar rage rising up from her toes. She could not believe her little boy could taunt her like this. What a brat he is, she thought. How dare he disobey me. Everything in her background told her he should be punished. She automatically raised her hand, but caught herself. She saw Jacob flinch. “Separate the child from the problem. Don’t blame the child,” she remembered from her parenting class. She took a deep breath, then several more. I’ll try it, she thought, convinced it would never work. Louise was speechless. A stunned, “Okay,” escaped from her mouth. Jacob climbed down from his stool, ran to the door and called the dog. Sophie was more than happy to oblige when Jacob showed her the puddle of milk on the floor. He grabbed the stool, climbed up to rip off a paper towel and happily wiped up the slobber and milk that Sophie had left behind. Louise is an average, middle-class mother, trying to get through breakfast, get her son to day-care and herself to work-on time, for once. Jacob pushed her button, and she almost lost control. But she didn’t. Instead, she defused her button and was able to use a parenting skill that worked-not only for her but for her son, too. “But shouldn’t he be punished for talking to her that way? He can’t get away with that!” is the reply of so many parents to this scene. Why? What would Jacob learn from being punished? Louise held him accountable for his spilled milk, gave him an opportunity to solve the problem, and he did, indeed, solve the problem-creatively and cheerfully. But somewhere deep down inside us, we want our children to suffer when they “make us” suffer. Retaliation comes automatically-it’s what we know. All parents get their buttons pushed by their children. Too many are provoked to react harmfully. Parents often hate the way they react but don’t know how to stop themselves. When Your Kids Push Your Buttons is about taking responsibility for your part in the conflict and then learning to neutralize your reactions so they stop interfering with your parenting. It puts a magnifying glass on your button. Authority is lost when you lose control in rage or withdrawal. Your child loses when he can push your button and fireworks go off. Authority is regained when you can respond with clarity and neutrality, and your child regains a sense of security. This book can help you do that. We punish our children in an attempt to keep them from pushing our buttons, often escalating the original problem into a cycle of anger and blame. When Your Kids Push Your Buttons is not about what to do to your kids to get them to stop pushing your buttons. This book is about how to be the parent you wish you could be-the parent that only you are holding yourself back from. After teaching parenting classes for more than ten years, I realized that many parents returned to class more discouraged than ever. These parents were excited to try out their new skills, convinced they would work. But then something would interfere and they couldn’t do it. It was because their buttons were getting pushed. No skill can come to the rescue of a parent who’s button has been pushed. I realized a critical step was missing in parent education-how to get that button defused so the skills could work. This book is the result of many more years of teaching a parenting course called “When Your Kids Push Your Buttons.” As is the course, the book is meant to be interactive so that you can apply it to your own situations. The exercises are meant to help you do that. It must be acknowledged that the expectations and values that parents hold for their children’s behavior vary from culture to culture. The behavioral examples I use in this book may not fit all readers-they may not be your button-pushers. What I intend is for you to translate these examples into whatever behavioral difficulties may be creating the dramas that play out in your own parent/child relationship. The exercises will help you do that. Principle #1. There is nothing more important in parenting than connecting with your child. When we are connected, we can pass on our values and influence their decisions. Principle #2. Every child is born perfect. Each one comes to us, whether by birth or adoption, for the benefit of our mutual learning and brings us an opportunity for our personal growth. Principle #3. Children want to be successful. No child is happy being manipulative or out of control. Principle #4. Children’s behavior is symptomatic of their internal emotional, physical or neurological state. To affect their behavior, their internal state must first be accepted and then addressed. 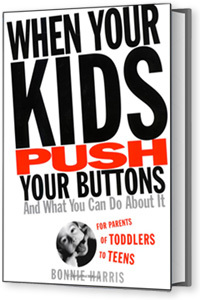 Button-pushing behavior is a clue to an unattended need in the child, and in the parent as well. Becoming conscious of those needs is the first and most important step. Without consciousness, we will continue to focus on preventing our children from pushing our buttons and tapping into a very uncomfortable place. It’s our job to reach across to our children, step into their shoes, consider their developmental stage, their individual temperament, their level of normal egotism, and know what we can appropriately expect of them. Asking children of any age to be responsible for how we are feeling and to behave in a way that is convenient for us or will make us happy is wrong. The good news about getting our buttons pushed by our vociferous children is that, in the pushing, they present us with an opportunity for personal growth and healing. The question is, will we use that opportunity? Or will we reprimand our children for being unruly and ourselves for being incompetent? We can fool ourselves into believing that we are behaving in our children’s best interest when we force them to do and be what we want. In doing so, we risk their needs for the sake of putting an end to our frustration, impatience or rage. We work hard at training our children to be who we want them to be. Some children acquiesce and some don’t. The ones who don’t are our teachers.